I was given this chapter selection to read from the International Stoic Forum yahoo-group, and I found it quite interesting. So much so, that I just ordered the whole book and I quite look forward to reading it when it arrives. The question at hand is death. Not “if” death, but moreso our fear of it. The ancient Stoics had many exercises and thoughts on death, and it has been suggested that to live virtuously and die well is the whole aim of philosophy in general, and Stoicism in specific. The first argument for why we should unburden ourselves of the fear of death is teleological. Every one of us has seen and experienced death. From that of those close to us, to strangers in foreign lands, and insects, animals, food, etc. It seems unreasonable to state that man mustn’t die, for everything in our experience points otherwise. If we then accept, at least intellectually if not yet at the core of our understanding, that man is mortal, and I being man must die, we can begin to handle the fear. I fear death. It scares me. It’s unknown, it’s forever, and I may have very little control over it. The Stoics would argue that these are the exact reasons one should not fret over them. There are two spheres of influence in the world, those things which we can control, and those which we cannot. Wisdom lies, in part, in divining which is which. The Stoics argue that those things only which we can control are our reactions, thoughts, emotions, and actions in this world, and literally everything else is outside of our realm of influence. Since we know that death is natural, it follows that things which are natural are neither good nor evil. The sun, trees, ants, cosmos, man. The actions of rational beings might be good and evil, however. Our reactions might also. So if death is merely an indifferent thing, it behooves us to choose our reaction to it appropriately. The chapter selection above also makes note that many other men have faced death with equanimity, with courage, acceptance, and honor. Is it that these are so much greater than I; or is it merely that their thinking is better? If it is the former, than so be it. But if it is the later, then there should be something I can do about it. “Our fears tend to be irrationally selective and when confronted with the stark logic of ‘If you worry about that you might as well worry about everything’, people are often forced to concede that becoming preoccupied with hypothetical catastrophes in general is a waste of time and energy. To be everywhere is to be nowhere, and to fear everything is to fear nothing”. 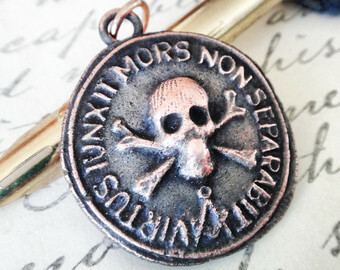 The purpose of momento mori is not a morbid fascination with death (pun intended), but that we might in fact more appreciate life. It is only by looking at relative positions and values that we can determine value. A focus on death gives us an unflinching barometer with which to test life. It’s purpose is liberty. If a man always fears death, he might not live. Death is assured, no question. So the fear of it is the real enemy! To shirk that fear, to drop those heavy chains of lassitude and immobility, to wake from its paralyzing effects: that is the goal! The phrase “live every day as if it were your last” has become so cliche as to lose all meaning for most folks. Often it is interpreted to be a sort of hedonistic anthem, #yolo ! But in fact, and reading this chapter finally drove it home to me, if one were to wake up and think “Today I will die, or if not today, then surely tomorrow.” How would that change how I lived? At least right now, sitting here in the afterglow of these thoughts, I don’t see myself playing on my cellphone while I could be sitting with my family and friends, despite my high score of 41 in Flappy Bird. If as we lie down to sleep, we think “I may not wake” would we be pleased with how we had conducted ourselves throughout the day? Most days, for me, this is not so. I would like to change that. I very much enjoyed this chapter selection, it is thought-provoking and interesting. I look forward to reading the rest when it arrives.